As interest grows in adding grasses to dairy rations (to add digestible fiber and improve cow performance and health), many dairy producers find themselves learning about a feedstuff they haven’t grown or used in many years. This Fact Sheet will explore some reasons for feeding grasses, discuss some of the agronomic considerations producers need to think about when growing grasses for dairy rations, and consider some differences between growing alfalfa versus grasses. It is not about grazing, or growing grasses in mixture with alfalfa, or harvesting whatever is growing on the Back 40 as an emergency source of forage; it is about growing grasses as an intentional source of high quality forage for dairy rations. A TMR mixture of grass and legumes has more total fiber compared to alfalfa alone. 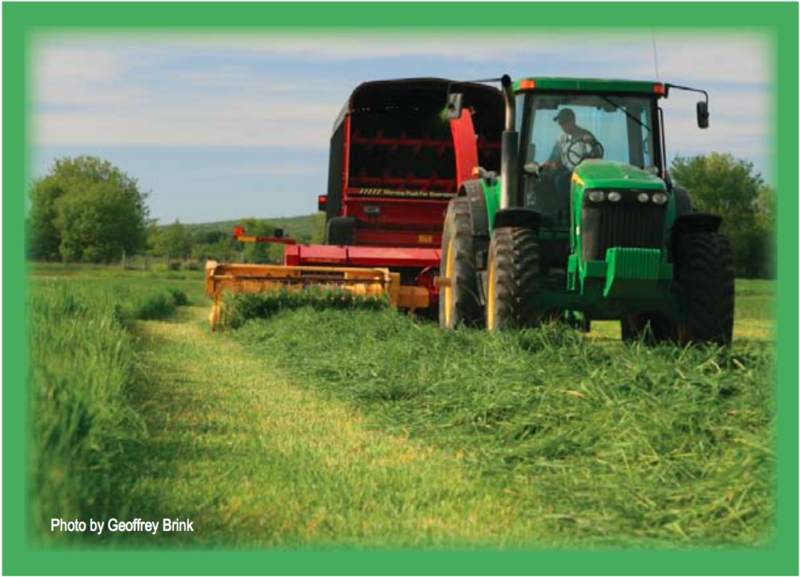 Grass has a higher proportion of digestible fiber than either alfalfa or corn silage alone. Grass can be a good fit with corn silage, which is lower in fiber and is high in non-fiber carbohydrates (the grain portion). But because grasses increase the fiber content of a ration, they will also slow the passage of feed through the cow. If all other ration components remain the same, this will also reduce intake. Research has shown that grass-based diets have little negative effect on cows that have lower nutrient demand, such as late-lactation cows, dry cows, and heifers. But adding grass can reduce milk production when cows are at peak lactation because of the reduction in feed intake. 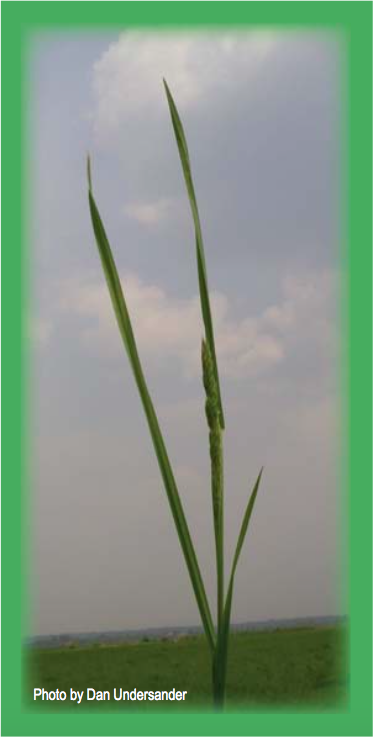 From an agronomic perspective, advantages of growing grasses include: grasses are adapted to a wide range of soils; there are fewer problems with pests and winterkill with grasses compared to alfalfa; grasses dry faster than alfalfa; grasses are highly responsive to nitrogen; and, for dairy producers growing their own feed, grass fields provide an additional option for applying manure and managing manure nutrients. Grass seed and varieties should be chosen with as much care as corn and alfalfa. Don’t just plant whatever the feed mill has in stock; choose seed with a named variety as opposed to “variety not stated” on the label in order to take advantage of genetic improvements. Choose varieties with medium to late maturity for maximum flexibility in scheduling harvest and with rust resistance to avoid forage quality and palatability problems. 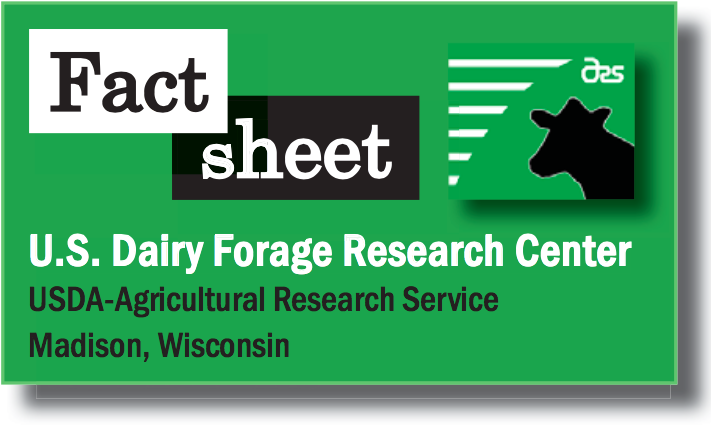 One good source for comparing grass varieties is the University of Wisconsin Team Forage web site at https://fyi.extension.wisc.edu/forage/ (select “Forage Species,” then “Grasses”). Another good source is Cornell University, http://www.forages.org/ (select the “Forage Species Selector”). Many states with a forage extension program will have local variety-trial information available on the web. To attain successful establishment in a new grass field, first follow the seeding rates recommended by a local university. More persistent grass may be sown with less persistent grass for faster cover and improved seeding year yield. For example, seed tall fescue or orchardgrass @ 10 lb/acre with Italian ryegrass or Festulolium @ 2 lb/acre. Seed in the spring (April to May) or summer (July to August) into a firm, well-prepared seedbed at a depth of 1⁄4 to 3⁄4 inches, depending on seed size. Apply 30-40 lb nitrogen/acre when seedlings are 4-6 inches tall. Control broadleaf weeds with herbicides and annual grass weeds by frequent clipping in the establishment year. Alfalfa fixes its own nitrogen, but grasses need some help via fertilizer and/or manure. Applications made in early spring, before and after the first harvest, have the greatest impact on yield due to seasonal growth patterns. As shown in Figure 1, the annual yield of grass continues to climb as more and more nitrogen is applied. 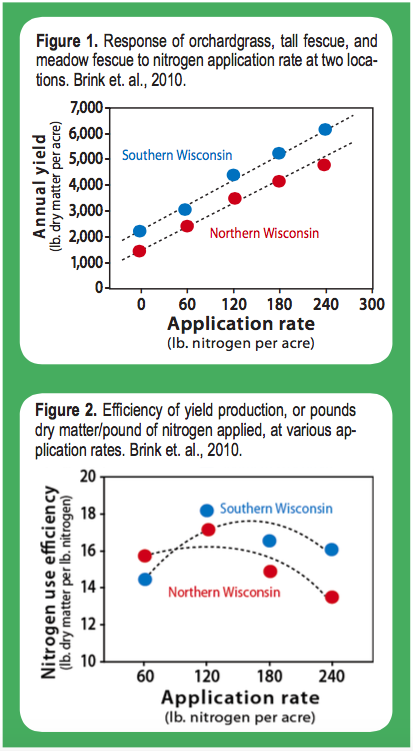 Figure 2, however, shows that the efficiency of yield production, or the pounds of dry matter pro- duced per pound of nitrogen applied, declines after the annual nitrogen rate exceeds 120 to 150 pounds nitrogen per acre per year. One of the biggest advantages of growing grasses on a dairy farm is that it opens a new window of opportunity for spreading manure. Manure application on corn and other annual crops is generally limited to early spring before planting or in the fall after harvest. But with a grass forage crop, manure can be applied in early spring and after each harvest through the summer. Because of the high nitrogen need of forage grasses, there can be large yield increases from manure application. And because of the year-round vegetation and fibrous root system of grasses, there is less potential for nitrate leaching than with corn. As with any surface broadcast application, there can be large losses of nitrogen to the air as ammonia. 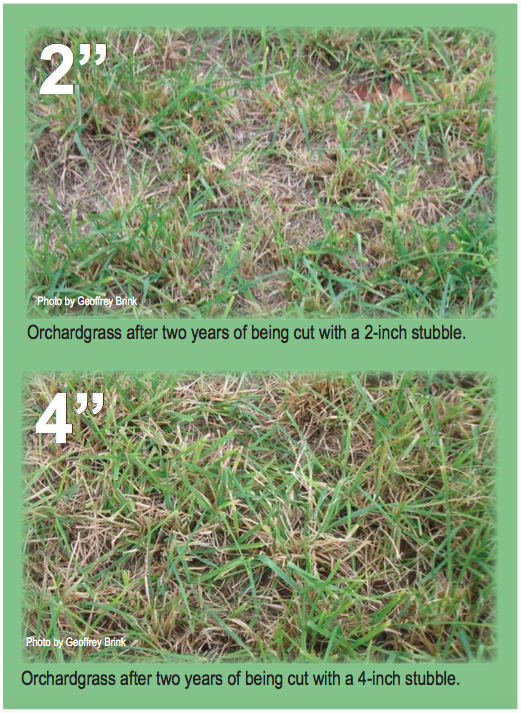 To minimize these losses, avoid applying under warm, windy conditions. Even better, equipment is now available to band-apply or partially incorporate liquid manure, which reduces volatile losses of nitrogen. Whether fertilizer or manure is used as the nitrogen source, use a split application, with no more than 60 pounds nitrogen per acre in each application, to improve the utilization efficiency by the crop and the cows; excess nitrogen fertilizer leads to more protein in the crop and consequently more nitrogen excreted in the manure. As beef cow-calf operators well know, a high potassium concentration in grasses can cause problems with cows after freshening. High dietary potassium levels raise the blood pH, which interferes with calcium absorption from feed and mobilization from bones. This can lead to milk fever (hypocalcemia, or low blood calcium). To reduce the risk of milk fever, stop feeding high-potassium grasses three weeks prior to calving; orchardgrass and perennial ryegrass have the highest levels of potassium. Ways to manage grasses to reduce their potassium concentration include: grow on low- to medium-potassium soils, if possible; feed first cutting to heifers and dry cows because the potassium concentration is highest in the spring; and apply manure in the summer or fall when potassium content of the grass is lower. Timing of harvest is a major consideration in the spring. The quality of grass is higher in the spring but declines more rapidly, compared to alfalfa (Figures 3 and 4) and also when compared to subsequent grass cuttings when the quality is lower but declines more slowly (Figure 5 on back). Therefore, timing of the first cutting is more critical whereas timing of summer and fall cuttings can be delayed a bit if needed. When harvesting grass for hay or silage, cutting height is a major consideration. A closer cut means a higher yield. In one study conducted for two years (3 harvests/year) at both Marshfield and Lancaster, WI, average yield for grass hay cut with a 2-inch stubble was 6,900 pounds/acre/year while the fields cut with a 4-inch stubble yielded 5,400 pounds/acre/year. However, a shorter cutting height led to a less persistent stand (see pictures on back). If stand persistence is important, leave an adequate stubble height of about 4 inches. If the grass will be rotated in two or three years, don’t worry about stubble height. When ensiling, grasses should be put up at 60 to 65% moisture if going into a bag, bunker or pile silo. Moisture content should be between 50 and 60% for tower silos. If you are making wrapped bale silage, moisture should be less than 60%. Remember that grasses dry faster than alfalfa, so monitor the moisture closely. And don’t judge just by the feel; a “soft” feel does not mean that it’s wet (as it does with alfalfa). Compaction is critical to making both grass silage and alfalfa silage. However, at a given moisture using the same packing practices, the density of grass silage is generally less than alfalfa silage, so pay particular attention to packing. Silage inoculants have been shown to be beneficial with grass silage, improving dry matter recovery and animal performance, but they are not a substitute for good management. Decide how producing grass fits into your farm management and how feeding grass forage fits into your herd’s ration. Grow and manage grasses as carefully as you would alfalfa. Attention to detail during establishment and harvest results in productive stands having the potential to provide high quality forage appropriate for dairy diets.